Chrichton's World: Review Thunderheart (1992): For me this is a very underrated classic! 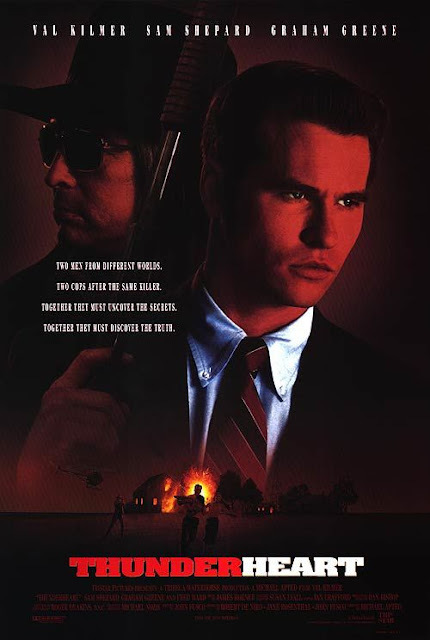 Review Thunderheart (1992): For me this is a very underrated classic! Recently I watched Thunderheart again. Had been a while, but I think overall I must have seen it 12 times if not more. And every time this films gets to me at the same parts as it did the first time. Not a single second of this film is boring or a waste of time. Even knowing the outcome and all the twists and turns doesn't change much. Above all, this is a film that still is relevant today as if the people involved into making this film had foresight of what was to come. (One of those people is Robert De Niro, who is attached as producer.) If that is not telling of the fact that this is a classic then I don't know what is. Since a lot of what occurs in the film is very plot heavy I won't say much about it other than that we get to see Val Kilmer back when he still was making good movies. He is very believable as the fish out of water reconnecting with his roots. This is easily the main draw of the film since it touches upon some serious and dramatic events but at the same time also provides a lot of comic relief. Although most of that is channeled through the excellent Graham Greene (the actor not the writer). Even after the twelfth time I found myself enjoying this film thoroughly and I am amazed how many people seem to have missed this gem. Thunderheart also is an example of how much you can achieve if you put a lot of work and heart into a project. And that it is possible to be fresh concerning a genre that has been done to death. If you have not seen this film yet then you owe it to yourself. Since this is a must watch for sure!